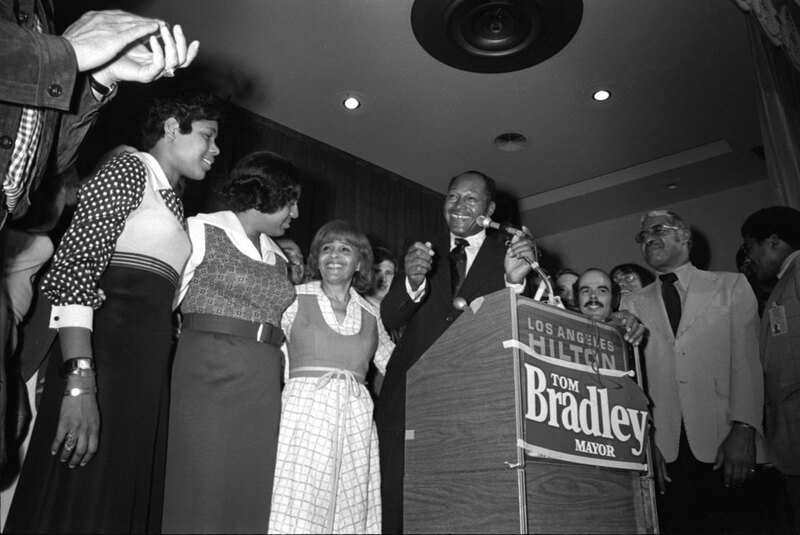 From left to right, Phyllis Bradley, Lorraine Bradley, Ethel Bradley and Tom Bradley as they celebrate the election of Tom Bradley as mayor of Los Angeles in 1973. The photo was taken by Guy R. Crowder and is part of the Tom & Ethel Bradley Center’s collection at CSUN. California State University, Northridge has joined forces with the Tom and Ethel Bradley Foundation to develop a unique resource for the study of the ethnic communities of Los Angeles and the sharing of their stories. The Tom & Ethel Bradley Center at CSUN will build on the efforts of the university’s Institute for Arts & Media to preserve the visual history of Southern California, with an emphasis on ethnic minority communities. The Bradley Center will continue the collection and archiving already done at CSUN and will encourage research into and exploration of the collections. “This is a very exciting step forward for us at CSUN,” said journalism professor Kent Kirkton, director of the Tom & Ethel Bradley Center, named for the late Los Angeles mayor and his wife. “We already have a significant historical collection of approximately a million photographs and many dozens of oral histories documenting the ethnic communities of the region. Now, having cemented our relationship with the Bradley family and foundation, we expect to be even more productive. Lorraine Bradley called CSUN the “perfect partner” to carry on her parents’ legacy, which included a respect and love for Los Angeles and its residents. “Daddy wasn’t mayor of just one section of Los Angeles; he was mayor of all of LA, and the people who live here and voted for him for five terms knew that,” she said. “It just seems right that Cal State Northridge, one of the biggest and one of the most diverse universities in the country, be home to a center dedicated to his and my mother’s legacy. “People forget that the San Fernando Valley is part of the City of Los Angeles, and CSUN, with its rich diversity of students, truly represents all the people of Los Angeles,” Bradley said. Kirkton said the Bradley Center will continue the institute’s efforts to preserve the area’s visual history, but will have a renewed focus on the years when Tom Bradley served as Los Angeles’ mayor, from 1973 to 1993. Bradley was Los Angeles’ only African-American mayor, and his 20 years in office marked the longest tenure of any mayor in the city’s history. Bradley was the grandson of a slave and born to poor sharecroppers in a small log cabin in Texas. His family moved first to Arizona and then California in the early 1920s. He attended UCLA on an athletic scholarship, but left his studies in 1940 to become one of just 400 African-Americans in the Los Angeles Police Department. At the time, there were only two options for African-American LA police officers: serve in the predominately African American Newton Street Division or work traffic downtown. He married his wife, Ethel, in 1941. Tom Bradley spent his days as a police officer and attended law school at night. He became active in Democratic politics and eventually won a seat on the Los Angeles City Council in 1963. In 1973, he unseated incumbent Sam Yorty to become mayor. While her husband oversaw Los Angeles, Ethel Bradley avoided the political spotlight. She held teas, rooted for the Dodgers from her permanent seat behind home plate at Dodger Stadium and took pride in cultivating a garden showcase at the mayoral mansion in Windsor Square. Tom Bradley died in 1998, and Ethel Bradley followed him in death 10 years later. The Tom and Ethel Bradley Foundation was established in 2003 and was charged with carrying on the Bradleys’ legacy. CSUN’s Tom & Ethel Bradley Center will absorb the functions of the university’s Institute for Arts & Media, which was originally established by Kirkton in 1981 as the Center for Photojournalism and Visual History. In addition to having an extensive collection of photographs, the institute gathered oral histories, manuscripts and other ephemeral materials supporting the photograph collection. The Bradley Center holds more than 1 million images. Many of the images were produced by African-American freelance and independent photographers in the African-American communities in and near Los Angeles. Other noteworthy collections held by the Bradley Center include images by acclaimed Mexican photographer Julián Cardona, who spent the past two decades chronicling life on both sides of the border; the late freelance photographer Richard Cross, who documented the wars in El Salvador and Honduras for Newsweek, Associated Press, The New York Times and U.S. News & World Report, where he was nominated for a Pulitzer Prize; Emmon Clarke, a volunteer photographer for César Chávez and the United Farmworkers during the formative period of the union; and photographer Herb Carlton, who spent his career at the Los Angeles Daily News, starting at the paper when it was known as the Valley News and Green Sheet.